FORT COLLINS – The trip down Mason Street on MAX, Fort Collins’ new bus rapid transit line, begins like any other bus ride. But this bus is unlike any the city ever has run. Tickets are purchased at special kiosks; cyclists hang their bikes on the side, and the vehicle itself runs up and down a dedicated guideway, unimpeded by the traffic most public buses must battle each day. Transfort officials say it has opened public transportation to previously untapped demographics, such as the elderly. Transfort is Fort Collins’ public transportation agency. 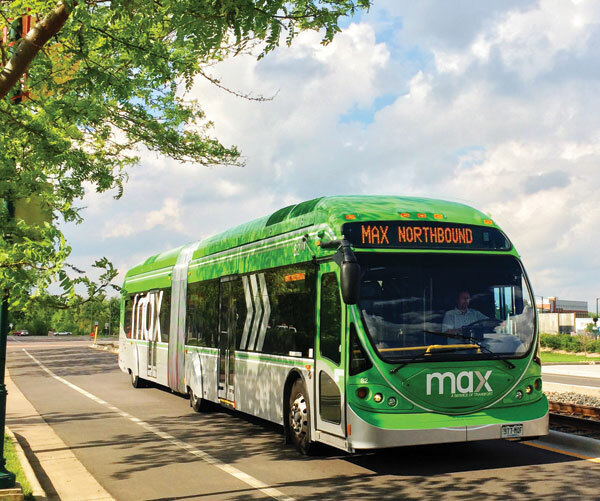 Although MAX is still in its infancy – it has run for slightly more than two weeks – it is averaging 3,000 riders a day, said Tim Wilder, Transfort service development manager. The city hadn’t expected to reach that passenger count for another year. MAX is free to ride until Aug. 24. Wilder said he expects a small drop in ridership numbers after that, but added that he believes fares are affordable enough that the decline will be small. The bus is more than half-full once it reaches Mulberry Street from the Downtown Transit Center. The buses and the new, MAX-specific stops are green in color and run on compressed natural gas, which Wilder said beat out diesel because of Fort Collins’ ingrained environmentalism. The city wanted to make MAX electric, but Wilder said that would have required too great an investment in a still-gestating technology. The city also hopes the Downtown Transit Center and the new South Transit Center will receive LEED certification for their green-building strategies, said Mick Syzek, a genial MAX driver. Syzek, who has driven buses for Transfort for 14 years, said that roughly 60 Transfort drivers are trained to drive MAX; the only requirement is that they have a year’s experience. Syzek said he enjoys the two days a week he drives MAX, finding it a welcome respite from driving conventional buses in heavier traffic. MAX already has changed the landscape of downtown Fort Collins. Wilder said the city has seen a surge in what it calls “transit-oriented development projects” around the new MAX stops. The bus passes by an almost-complete apartment complex directly behind a MAX stop at the intersection of Mulberry and Mason; a sign in front says the flats are pre-leasing for August. MAX doesn’t travel rapidly on Mason, but after it ends at University Avenue the southbound bus shifts onto a dedicated guideway where it quickly picks up speed. As it flies along, it makes a high-pitched whine that is familiar to anyone who has used Denver International Airport’s underground trams. Syzek said guideways comprise 75 percent of MAX’s route. The bus pulls up to the South Transit Center 21 minutes after it departed downtown. According to Google Maps, the journey takes 14 minutes by car on College Avenue, but many of MAX’s riders said the extra seven minutes is a worthwhile tradeoff for less traffic and money spent on gasoline. Passenger Garry Moore said MAX is the “best thing Fort Collins has done in years.” Moore and his wife, Helen, were eating at Red Tail, a coffee shop in the South Transit Center. The longtime Fort Collins residents never rode the bus before MAX started running. “We used to ride horses,” Moore joked. The Moores are two of many first-time riders who have utilized MAX. Wilder said families with children are the largest new demographic MAX reaches, and senior citizens such as the Moores like having a viable alternative to driving. With MAX’s early success, Wilder said Fort Collins already has identified other urban corridors for potential rapid transit systems. These areas, which the city calls “enhanced travel corridors,” include Elizabeth Street, Timberline Road and Harmony Road. These other rapid transit systems are obviously years away, Wilder said; creating MAX required years of fundraising and massive improvements to Fort Collins’ infrastructure. Still, he said, MAX has shown the city that people in Fort Collins embrace rapid transit. Kat Udarro, a barista at Red Tail, said MAX is a long-term investment in the community. He said he hears mostly positive things about it, but added that some customers are unhappy with how MAX has changed schedules and routes for Transfort’s other services. Wilder said MAX compensates for the shuffled schedules because it runs every 10 minutes. Back in the Red Tail, Garry and Helen Moore finished their coffee and prepared to leave. They planned to tell a 96-year-old friend about MAX; they said his limited mobility and inability to drive prevent him from getting out, but think MAX could allow him to travel again. “It could give him the city back,” Garry Moore said.